There were only a few musicals produced in the 3D process during the Golden Age of 3D production, and this fact gives Lewis R. Foster’s Those Redheads from Seattle some little distinction. Plot: A woman takes her four beautiful daughters to Dawson City Yukon during the Gold Rush to find their fortune. 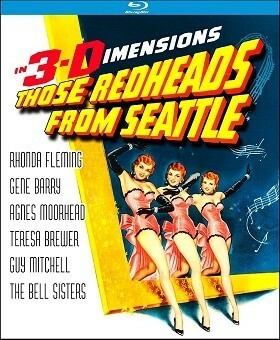 There were only a few musicals produced in the 3D process during the Golden Age of 3D production, and this fact gives Lewis R. Foster’s Those Redheads from Seattle some little distinction. While not the greatest 3D musical (that would be MGM’s Kiss Me Kate by a country mile), Those Redheads from Seattle emerges as a tuneful good time with some pretty girls, a decent song score, and production values that routinely mesh real outdoor photography with the studio backlot exteriors which were the norm for the era. Brought back for public consumption by the 3-D Film Archive who have done another miraculous job at resuscitating the dead from film vaults around the world, Those Redheads from Seattle will be another must have especially for fans of 3D. After printing continuous bad publicity over loose morals and unspeakable vice at the Klondike Club in the Yukon territory, newspaper owner Vance Edmonds (Frank Wilcox) is gunned down by club owner Johnny Kisco’s (Gene Barry) right-hand man Mike Yurkii (John Kellogg). A letter Edmonds before his death had sent his family in Seattle convinces them that they’re needed in Dawson, so Mrs. Edmonds (Agnes Moorehead) packs up her four daughters: Kathie (Rhonda Fleming), Pat (Teresa Brewer), Connie (Cynthia Bell), and Nell (Kay Bell) and heads to Alaska to join him. In Skagway, the quintet meets Johnny Kisco who offers to drive them the rest of the way to Dawson along with his headline entertainer Joe Keenan (Guy Mitchell). Once there, Kathie, who had begun to fall in love with Johnny, is disillusioned to find that her father and Johnny had had an adversarial relationship, and she wrongly blames him for her father’s death. Their break-up and Pat’s growing need for independence from her overly controlling mother splinters the family at the very moment they need one another the most. Director Lewis Foster concocted the slim storyline with fellow writers Geoffrey Homes and George Worthington Yates, and it’s an adequate (though no better than that) hanger for the assorted romances, silly misunderstandings, and musical numbers draped onto it. The screenwriters don’t really develop the triangle relationship between Johnny, Kathie, and local minister Reverend Petrie (William Pullen) enough for it to gain any traction or for us to develop a rooting interest for one side or the other. (There is also a romance between Joe and Connie that isn’t developed either, another lost opportunity.) The most interesting of the storylines involves Pat’s rebellion against her mother, ditching singing solos with the church choir to headlining the stage show at the Klondike Club. With popular songstress Teresa Brewer in the cast, it’s no surprise she gets the lion’s share of the songs: the introductory “Mr. Banjo Man” (which the other sisters join for a few bars where they can kick up their heels for the 3D camera), the sultry “Baby, Baby, Baby,” and a duet with fellow recording star Guy Mitchell “I Guess It Was You All the Time.” Mitchell also gets the movie’s production number showstopper “Chick-A-Boom” which he handles with aplomb. The Bell Sisters who play Connie and Nell have the other tune “Take Back Your Gold.” The fairly light-hearted fluffy story turns deadly serious in the last ten minutes as director Foster ramps up some tension as Johnny and his former henchman Mike Yurkii meet on rocky, snow-encrusted peaks to settle their differences once and for all. Rhonda Fleming gets top billing in the film, and she’s certainly stunning to look at with the bright blue eyes, flaming hair, and Edith Head’s attractive wardrobe accentuating her alluring physical attributes, but she’s not served well by the script with her misunderstanding with Gene Barry’s Johnny the kind of mistake which could have been cleared up in ten minutes of real-life conversation. Barry offers a stalwart leading man even if he doesn’t get to sing or dance. Guy Mitchell and Teresa Brewer take care of those departments more than sufficiently even if their songs (written by a number of different hands) are generally just okay. But the movie’s real secret weapon is Agnes Moorehead who takes the clichéd controlling mother role and makes her an interesting and determined woman for the era of the film. The film’s original theatrical aspect ratio of 1.66:1 is faithfully rendered in this 1080p transfer using the MVC/AVC codec. 3-D Film Archive restoration expert Greg Kintz has done a first-rate job reviving the mostly lost color from the remaining elements doing the best job possible in achieving consistency across the film’s 90 minutes in color saturation and density levels (though admittedly, there are fluctuations, completely expected for a restoration of this kind). Sharpness is more than adequate if not razor-edged. The image has been cleaned up nicely with the movie retaining the film-like grain structure one would expect. The movie has been divided into 10 chapters. From the moment the main titles pop out on various planes at the audience, it’s clear the 3D effects for the film will be masterful, and they are wonderfully intact throughout the presentation. In addition to the outstanding negative parallax effects as feet, hands, spewing beer, a newspaper, a parasol, and other objects project forward, the sense of depth is wonderfully alive in this presentation, and it’s clear the director tried his utmost to make his compositions as visually dynamic as possible with people and objects on multiple planes. The disc offers either the original mono mix in DTS-HD Master Audio 2.0 or a reconstituted stereo mix in DTS-HD Master Audio 3.0 which, while not the original 3.0 stereo mix which accompanied the movie in select theaters, would never be suspected as being newly minted were one not told ahead of time. While the center dialogue track seems a little underpowered in the opening reel, things get better and more balanced the longer the film plays, and the thrill of having the orchestra filling the front soundstage during the musical numbers really expands the film’s entire aural presentation and is my preferred audio track for the movie. The 2.0 track, while clean and artifact free, sounds humdrum in comparison. Audio Commentary: film historian Hillary Hess enjoys an interesting and lively discussion of the film, its production, presentation, and restoration with three members of the 3-D Film Archive: Jack Theakston, Bob Furmanek, and later separately edited into the track Greg Kintz. A must listen. Restoration Demonstration (5:27, 3D/HD): Greg Kintz narrates and displays in separate windows the motley assortment of video and audio elements he had to work with to bring the film into some kind of consistent home video presentation. Three Channel Audio Demo (3:00, 3D/HD): the number “Chick-a-Boom” is performed in a window while we see the activity going on in the newly mastered three channel track. Rhonda Fleming Interview (8:16, HD): 2006 interview with the star conducted by Bob Furmanek. Those Redheads from Seattle, the first 3D musical and the first widescreen film produced at Paramount, gets a valuable face-lift for home video courtesy of the 3-D Film Archive and Kino Lorber Studio Classics. For fans of musicals, the stars, or 3D, the movie despite its fluff and artifice is good fun and well worth owning. Recommended!